Hello from beautiful Prague at the second day of Directions EMEA. Well – let’s go deeper! The ability to invoice your customers, based on entries in your calendar. There is a Dynamics NAV Add-In in the calendar appointment to give you this ability. In the email section, there are buttons that integrate NAV with your emails. You’re able to see the contacts information in NAV, and such things. I already blogged about that here. From the contacts list, you can manually synch your NAV contacts to O365 people. The contacts will sync back to NAV as well (filters can be applied). I did find some information on DLP (Dynamics Learning Portal), like a walkthrough. Go check it out! I know I will :-). I think this is a very important new feature! The way these wizards are created needs some coding skills (quite some coding on the page). But you’ll get used to it :-). Speaking about simplified setup: it’s also simpler to setup Dynamics CRM from inside Dynamics NAV. OCR support for document lines. In my opinion, if this really works, that’s quite advanced! Visually validate and train the OCR service. As such, it’s just using the new online experience that Lexmark has put online to visually train and validate the OCR processing of PDF and image files. Microsoft has also worked on the Items. First of all, they introduce “Item Attributes“. Now, in my company, we have our own “attributes” (which we call “specifications”) which is – I must admit – more advanced .. which is good, because then we have a reason to keep it :-). But then again, many people will be happy, because finally you can have a dynamic set of attributes which you can use to enter Item “specification”. And even more .. you can filter the Item list on it as well! On top of that, you’re now able to better categorize your Items as well, by the ability to create an hierarchy of item categories and assign attributes to each item category. Next, it’s possible to cancel posted credit memos (sales & purchase) and you have package Tracking No. and Shipping Agent Code on sales invoices. Let’s just say we have “smarter sales and purchase documents” ;-). Also, some small additions to Fixed Assets were made. It’s now easier to set up with default setups (which you can modify) and you are able to register purchases of fixed assets through a special fixed asset G/L journal where you can also dispose of fixed assets. Smart notifications. Well, this must be one of my favorites. I must dive into it technically (and I will handle it shortly in a minute..), but in a way, it’s possible to give the user in-context notifications, and assign an action that the user can execute along with it. This is just a great user experience right under the fingertips of the developer. It’s intended to give the user advice and recommendations – it’s up to the user to react on them or ignore them (so, it’s not a confirm at all!). Users can install/uninstall from Extensions Mgt page. Next, there is now the possibility to publish Web Services per tenant. This was very necessary to combine with extensions. In my opinion, we should be able to create Permission Sets per tenant as well. That would be awesome! (or maybe it’s already possible, and I’m missing something ;-)). You can only imagine what immense effort it would take to change a tiny bit – let alone to plug in your own vertical into this system.. setting page-field properties on each page, on each field .. . This looks like the same way as the “Show Mandatory” property was implemented. I still hope I’m missing out on some information that all of a sudden makes this feature overly interesting. And, as you probably already assumed – there are C/AL statements for you to code against the Task Scheduler. In the demo on the Keynote, Claus showed an app that he built for a phone (looked like it), build in PowerApps (in about 4 hours) with data that was uploaded from 4 NAV instances (and I thought I understood there was also one AX instance) to the Common Data Model – and the PowerApp got the data from that. The designer op the app was completely online, very intuïtive. I haven’t checked out yet, but again, please do so with the above links. The more I dive into NAV 2017, the more I get stimulated to dive deeper .. as there are so much things I don’t know yet. Next thing that’s new but I’m quite unfamiliar with, is the Media and MediaSet datatype. It seems quite clear: this is where pictures are stored now. 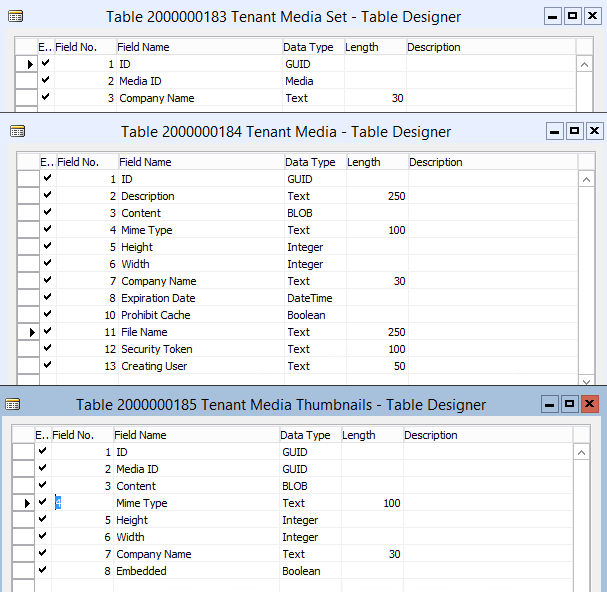 If you look at the Item table, you see that the “Picture”-field turned into a “MediaSet” datatype. So my guess is that when you want to use pictures: use that! And you “automagically” are using the system tables (kind of like you do when you use Record Links). This is an assumption – need to dive more into it. Expect a blogpost soon about it. But if you know more, please comment :-). The client that you see, is a well-known, new code editor, known as VSCode or “Visual Studio Code”. You can use it cross-platform (we will be able to write code on a Mac, or on Linux) and is available for many languages by the ability of installing “VSCode Extensions” to add an ability or language to the editor. As long as it (AL on VSCode) is not available, I have a tip for you: you can use VSCode for PowerShell as well – and it’s maybe a great way to get used to the editor! I’m doing that as we speak. VSCode is not ideal for PowerShell, but I truly believe, the more I use it, the more I’ll make it good enough for PowerShell. And I will be used to VSCode by the time we’re developing AL in this editor! Just my two cents :-). The future looks bright ;-). There are some other small goodies that I picked up from some Tweets of Jannik Bausager. Also, Tooltips are now available on fields in NAV 2017. I can only imagine how this has been implemented. Well, yet again, on Page-Field-Property (why do they keep doing this?? 🙁 ). The Mobile App now supports “tap and hold” on list pages to bring up Actions! Well, as Dynamics 365 is a big topic in the NAV world, it’s not the topic of this blogpost. For Microsoft – how I understood it – “Microsoft Dynamics NAV 2017” and “Microsoft Dynamics 365 for Financials” are two different products. And while the code base of both are the same for this release, Microsoft says it can’t promise that it will be kept the same in the future. And that makes sense. I truly hope it’s not going to be the same .. and we will have a codebase for On Premise, with stuff that makes sense for On Premise .. And visa versa: we will have additions/changes, especially for Dynamics 365, that makes sense for that business. And make no mistake. On Prem business is here to stay. That was very clear after the keynotes (Directions US and EMEA): it’s clear Microsoft has a clear “AND” strategy: On premise is absolutely important. It is what took this community this far, and it will drive that in the future. But do be aware about the new opportunities though: and that’s called “Dynamics365”. The market is moving – and we (partners) can grow and move with it, THANKS to Dynamics365 ! And, of course: http://aka.ms/NAVGetReady . You can even download a beta: Microsoft Dynamics NAV 2017 Limited Beta. This page also contains the “what’s new” that I used for this blog. I’m currently upgrading our product .. so I might come back with some “Best Practices” or “caveats” or “whatevers…” about upgrading to NAV2017 soon.. . Thanks for this great post waldo !!! Great review. A lot of new features around Outlook and Excel will require Azure AD login which can be difficult to deploy on SMB On Premise customers. Lot of interesting stuffs coming up. Thanks for sharing!! Thanks Waldo for the interesting post. I can agree with Xavier, the office integration requires Azure AD, so for on prem projects it won’t be so relevant. I was in the lab for Embedded Power BI. You need some configuration in Azure AD, and then you can see the report you’ve designed in Power BI in your rolecenter in NAV. Of course, the space is limited, so not every report looks nice in the rolecenter. You can expend the tile, and then you have access to the other reports you have as tabs in Power BI. This is all for the moment. They are working on new stuff, so that you can integrate a Power BI report on other sites like factboxes. Great blog Waldo! Very detailed and short ! Thanks for keeping community informed! Whank you for your post, Waldo! Also thank you for your great speak on Directions EMEA 2016, about Extensions and Power Cmdlets. This speak was really an eye-opener of me. Some interesting stuff here. Thanks! Thank you very much for this great and comprehensive review, Waldo! Really helpful.